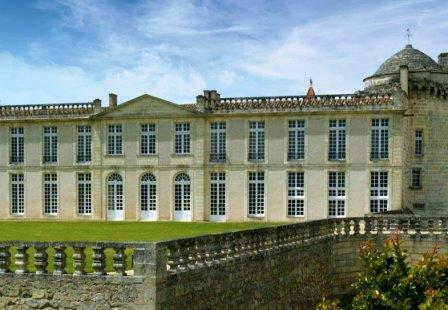 Chateau Laroque has a very long track record and history in the Saint Emilion appellation. Chateau Laroque dates back to the 12th century. In fact, a small remnant remains of the original tower built in the 12th century. The estate as we know it today, with its magnificent, chateau, was constructed in the 17th century by Marquis de Rochefort-Lavie. The property remained in the hands of the same family until the depression struck in 1929. Like many families and companies at the time, the owners did not have the funds to maintain the estate and the vineyards. Wine ceased to be produced at Chateau Laroque for several years. The modern era for Chateau Laroque starts in 1935, when the property was purchased by the Beaumartin family from the descendants of the Marquis de Rochefort-Lavie. In 1962, the vineyards of Chateau Laroque were completely replanted and the wine making facilities were updated as well. The situation remained about the same for close to 50 years. By that time, the chateau was in need of repairs, the cellars demanded updating and the vineyards required extensive replanting. Positive changes began taking place starting with the 2015 vintage as you will see. Today, Chateau Laroque is probably better known for the architecturally stunning, chateau and its perfectly manicured gardens. It truly is one of the most beautiful structures in the Right Bank. However, with all the improves taking place here, and their willingness to spend the funds needed to turn things around, you can expect things to begin to change rapidly. The 61 hectare vineyard of Chateau Laroque is planted to 87% Merlot, 11% Cabernet Franc and 2% Cabernet Sauvignon. The terroir is clay with limestone soil. The vineyard is situated northeast of the St. Emilion village in the commune of St. Christophe des Bardes. Chateau Laroque owns the largest vineyard in St. Emilion. However, only 40 hectares of vines are classified as Grand Cru Classe. The remaining 21 hectares vines are considered to be St. Emilion Grand Cru. Back to those 40 hectares, only 27 hectares of vines are used to produce their top wine, Chateau Laroque. As you can see, selection is important here, especially since it’s such a large vineyard. Their best 27 hectares, are located in the deep, clay rich soils close to Chateau Troplong Mondot. They have another outstanding parcel of vines on clay, close to their neighbor, Chateau Rocheyron. The vines are on average 40 years of age. However, they have old vines. 14 hectares of vines are almost 55 years old. The vineyard of Chateau Laroque is planted to a vine density of 6,000 vines per hectare. 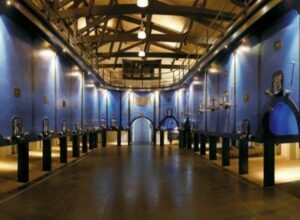 To produce the wine of Chateau Laroque, the wine is fermented in traditional, temperature controlled, cobalt blue, cement vats that vary in size to help with parcel by parcel vinification. The wine is aged in 50% new, French oak barrels for 12 months before bottling. About 11,000 cases of Chateau Laroque are produced in an average vintage. Chateau Laroque remains relatively unknown as the wines have not sold been en primeur by negociants. The wines were often released a few years after the vintage had been in bottle. Most of the production is sold in France. But that is slated to change. Chateau Laroque announced they were ready to start producing quality wine starting with the 2015 vintage. Earlier that year, they hired David Suire as the director of the estate. David Suire is experienced and well-known in Bordeaux, especially in Saint Emilion for his work with the team of Nicolas Thienpont and Stephane Derenoncourt. On average, the entire production of Chateau Laroque is slightly more than 25,000 cases of wine per vintage. There is also a second wine, Les Tours de Laroque, which can consist of more than 8,000 cases of wine per vintage, depending on the year. Chateau Laroque also makes a third wine, Chateau Peymouton which produces close to 5,000 cases per year from their non classified vines. Chateau Laroque needs some time before it can be enjoyed. Young vintages can be decanted for an average of 11-2 hours. This allows the wine to soften and open its perfume. Older vintages might need very little decanting, just enough to remove the sediment. Chateau Laroque is usually better with at least 5-7 years of bottle age. Of course that can vary slightly, depending on the vintage character. Chateau Laroque offers its best drinking and should reach peak maturity between 5-20 years of age after the vintage. Chateau Laroque is best served at 15.5 degrees Celsius, 60 degrees Fahrenheit. The cool, almost cellar temperature gives the wine more freshness and lift. Chateau Laroque is best paired with all types of classic meat dishes, veal, pork, beef, lamb, duck, game, roast chicken, roasted, braised and grilled dishes. Chateau Laroque is also good when matched with Asian dishes, hearty fish courses like tuna, mushrooms and pasta. Showing a dark hue, the wine opens with a strong mineral sensation, along with licorice, blackberries and dark chocolate. Medium/full bodied, the wine is sweet, elegant and fresh. The saltiness in the finish complements the dark red fruits and thyme throughout the endnote and there is a vibrancy and spicy quality to the fruits that is palpable in the finish. The wine was made with 99% Merlot and 1% Cabernet Franc, reaching 14.54 alcohol with a pH of 3.48. With a worthy depth of color, this wine reveals dark berries, earth and licorice in the fragrance. The fruit is sweet and juicy. There is complexity and vibrancy with a long, persistent boysenberry and black cherry finish. The wine was made with 95% Merlot, 4.5% Cabernet Franc and .5% Cabernet Sauvignon, reaching 14.5% alcohol with a pH of 3.35. This is the second vintage for Laroque with David Suire, the new director who has achieved great success in his efforts here. Medium bodied, the wine shows a strong minerality presence before you start to find the red fruits. There is a softness to the tannins and freshness to the fruit, which lets you know this is going to be an estate to watch. However, you should note that subsequent vintages are definitely stronger. Medium/full bodied, with a luscious texture that sets off the floral, licorice, cocoa and dark cherry personality, this wine is easy to like and drink, ending with rich textures and loads of sweet, fresh black cherries, fennel and cocoa. With David Suire as the new director, it is easy to see the improvements in just his debut vintage. And you know, the best is yet come! Medium bodied, with a forward, leafy, simple, fresh, red berry personality, and a one note, cherry and herb finish. Pleasant, early drinking, fresh, medium bodied, cherry and black raspberry inspired wine, with a bit of spice and fresh herbs in the finish. Earthy, leafy, fresh and already open with its cherry core of fruit. Medium bodied, with a leafy, red fruit finish. Forward, supple and serving up a nice dose of plum, licorice, earth and spice, this round, plush wine is already drinking well. Showing age in its color, the wine offers strawberry preserves and smoke and earth on the nose. Medium bodied, with sweet fruit, but the finish is clipped, making the wine far too short.